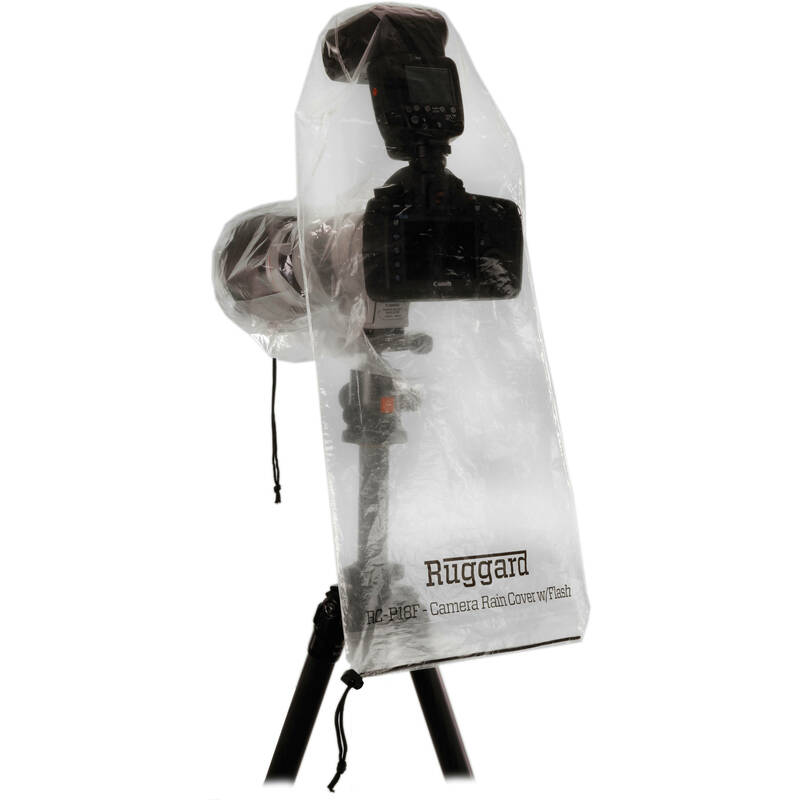 18" with Flash 8" with Flash 8" 18"
Photographers who like to shoot in the rain will appreciate the 2-pack RC-P18F Rain Cover for DSLR with Lens up to 18" and Flash from Ruggard. Each cover provides an easy to use way of protecting your DSLR with on-camera flash and lens from water, dust, dirt and mud. The cover will accommodate a DSLR with a lens up to 18" long and 7" wide. The polyethylene cover has openings for your camera and lens that are secured with drawstrings. The cover also has enough space to accommodate your lens hood. The cover is tripod-mountable by first placing your camera/lens combo inside and then placing the entire assembly over your tripod. The see-through design gives you complete access to your DSLR's controls and viewfinder. The pre-cut viewfinder hole lets you attach your camera's rubber eyecup from the outside of the cover. This assures optimum viewfinder clarity, even in harsh weather conditions. Box Dimensions (LxWxH) 8.2 x 6.4 x 0.8"
RC-P18F Rain Cover for DSLR with Lens up to 18" and Flash (Pack of 2) is rated 4.5 out of 5 by 58. Rated 5 out of 5 by Mike from Durable and effective cover I bought this to use over my gear while shooting Holi (a Hindu festival where dyed powder is thrown all over participants). It performed even better than expected in protecting my camera bodies and lenses, and I would have no hesitation about using this cover in a heavy rainstorm. The plastic is clear and easy to see through but very durable, and fits nicely over the camera with a drawstring that tightens it around both long and short lenses. A little difficult to turn knobs and wheels on the camera body if you're holding it on the outside as I was, but I believe you're meant to have you hand up inside the cover during normal use. Definitely recommend keeping one in your bag. Rated 5 out of 5 by Cheryl from Good protection from rain and salt spray I was looking for a means to protect my camera and lens when caught in a situation with rain or salt spray. I have not had an actual opportunity to use the rain cover with rain or spray yet, but I feel I am ready when it occurs. I installed the Ruggard RC-P18F Camera Rain Cover /Flash on my 70D with a 150-600mm lens with the lens hood and it fit well and was easy to install the cover quickly. The camera, lens and tripod were easy to operate and make adjustments as well as be able to see the LCD screen through the clear film and evaluate the exposure and histogram. There was plenty of room to install my Sunpac 433AF flash. The package came with two covers that fold flat and easily fit in my backpack camera bag. I am very satisfied with this rain cover. Rated 4 out of 5 by daniel from I have no idea When bought in conjunction with a lot of other items, only the front/back cover made it to my bag: the insert had open and content lost somewhere before the pick up counter. I don't know how well this is made, not if it's practical. In the meantime, I bought the Ruggard RC-P18 Rain Cover, which fits well (My camera bodies are weather sealed but some of my lenses aren't.) The price is well worth protecting expensive gear, and I am looking forward to using these in the field. Rated 3 out of 5 by Vutama from Decent Rain cover The reason i bought this was because i was taking pictures during blizzard. So i thought i'd rather spending few extra bucks than having my camera fixed in the service center which could cost more. This rain cover is very durable, although this is made of plastic. It fits my camera well. However, i think it'd be better if they can provide a better rope version. It kept sliding from my lens. So it's either reveal my lens or cover the lens. Rated 5 out of 5 by The Night Photographer from Works great Durable, not flimsy plastic. Bought it on a whim and ended up using it that night when I got caught in a rainstorm. Rated 3 out of 5 by John Farrell from Used it the day I got it Used it the day it arrived, we had flash floods here in Las Vegas. It held up okay, not fantastically, but adequately. Caused stickiness inside sleeve, but tolerable. Not designed for major rainfall in buckets all at once but is suitable for light rain long enough to get your shots. A bit of a hassle wrapping camera, takes a bit of patience. Overall worth having, the price is right. Has anyone tried using this with a c100? I don't have that camera. But I did use this up in Alaska this past summer and fund it to be of use. It looks like a plastic bag but the material is stronger. I bought 2 because I was afraid it might tear but it lasted the whole trip and I still have it. I figured at the price point it was worth the shot. Yes, if you don't accidentally rip it while using and put them away nicely.